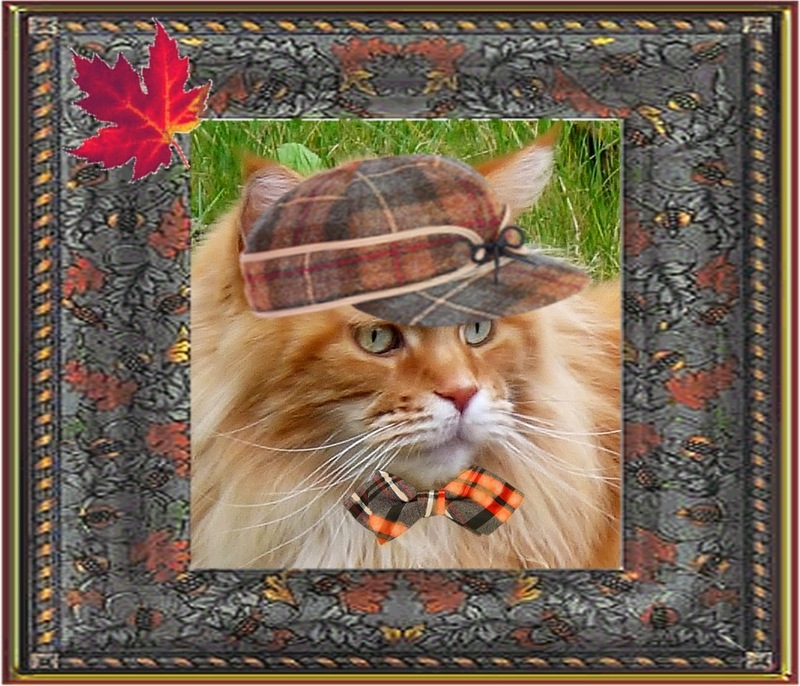 Wendy's 3-D Cats: 3-D FALL HAT PURRADE! As you know, the 3-Ds absolutely adore their hats, so today I have allowed them to put on a Hat Purrade as a salute to Fall. 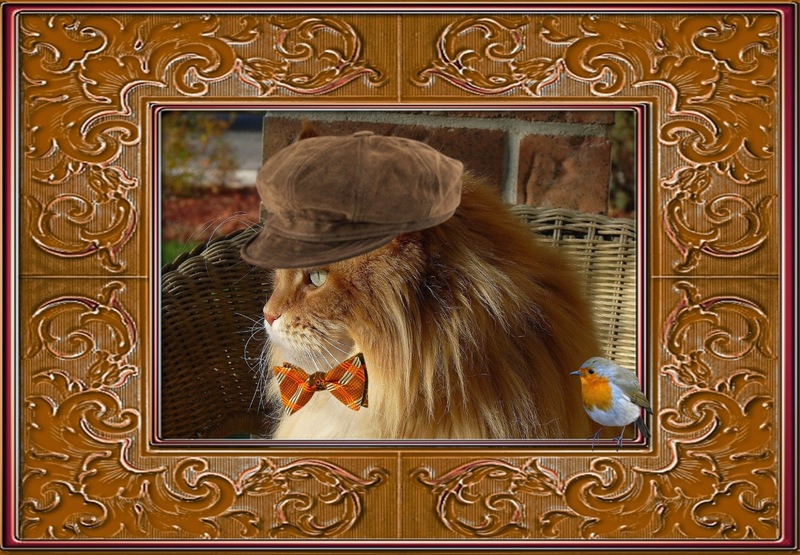 Dante's in a brown corduroy newsboy cap with a flashy orange and brown plaid bowtie. The little robin is wondering whether he should be bob, bob, bobbin' on over to greet this strange creature. After all, it could be a relative! 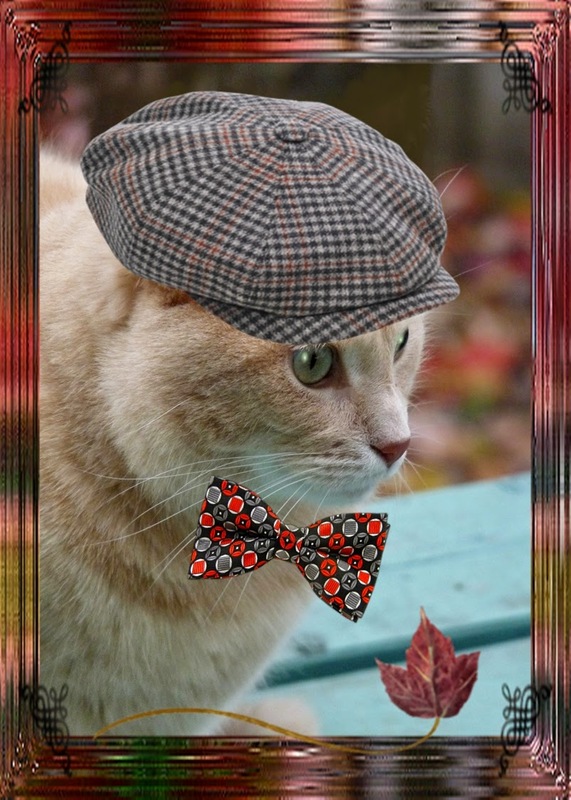 Dylan is efur-so-dappurr in his gray and red glen plaid wool cap with coordinating bowtie. Leaf it up to him to make a real fashion statement. He thinks fall is just wonderful. Domino's wearing a newsboy cap, too, even though she's a girl because, of course, she believes in equal oppurrtunity. And true Canadian that she is, she's also sporting a red maple leaf atop her hat. Or maybe it just landed there purr chance! Dante is very sporty sporting his rust-coloured and gray plaid wool hat. "It's good fur huntin'!, says he excitedly. Unfortunately, the only thing he caught after a long day on the hunt was his foot in a rabbit hole. "But it wuz a LUCKY rabbit hole", says he, undeterred. 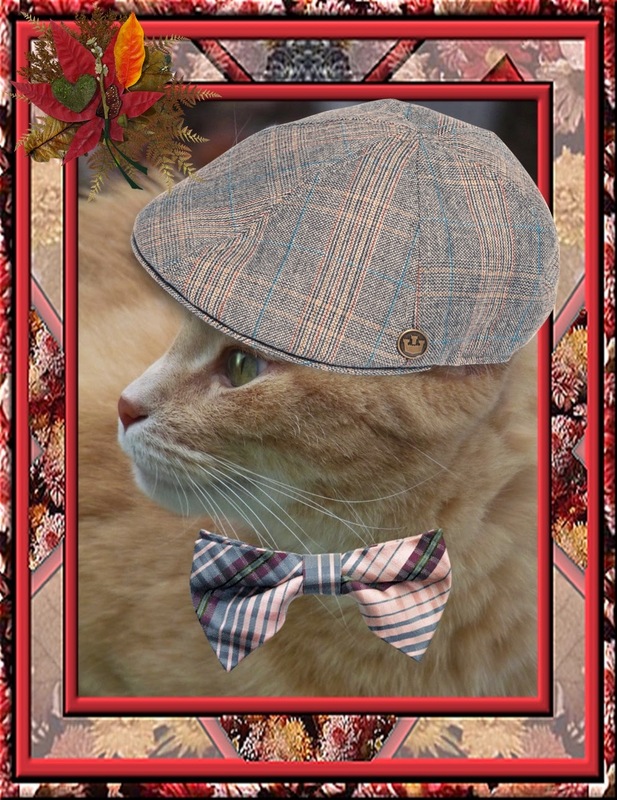 Dylan's changed into a peach, blue and brown plaid flatcap which matches his fur-tones purrfectly. He's having a real ball out there amongst all the leaves in the back yard. 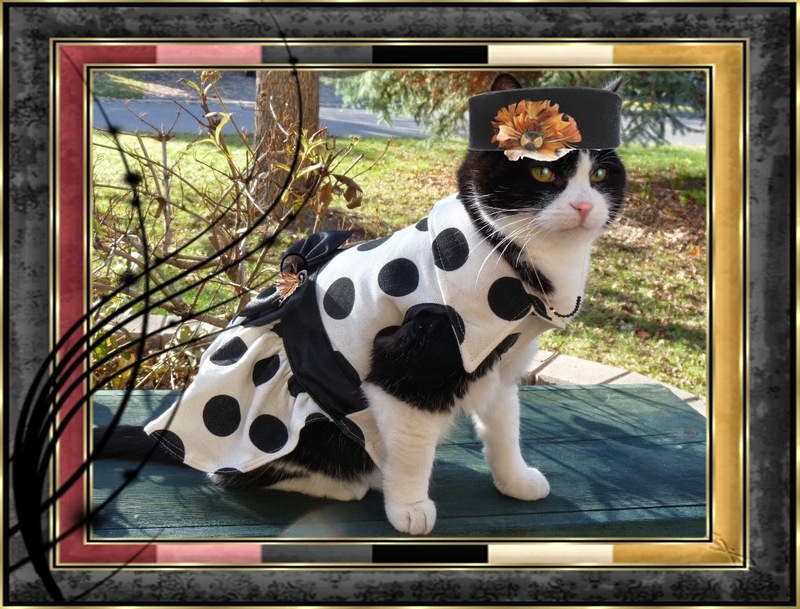 It's not hard to spot Domino in this trendy outfit! She's topping it off with a black pillbox hat with ruffled feather and a coordinating accent on the bow at her waist. 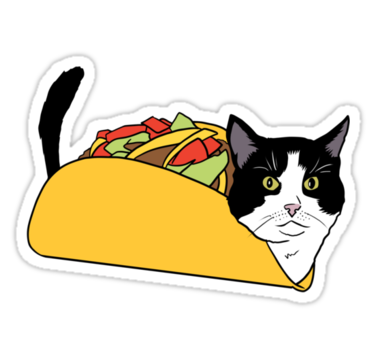 She's gonna be the 'taco the town' in this one! 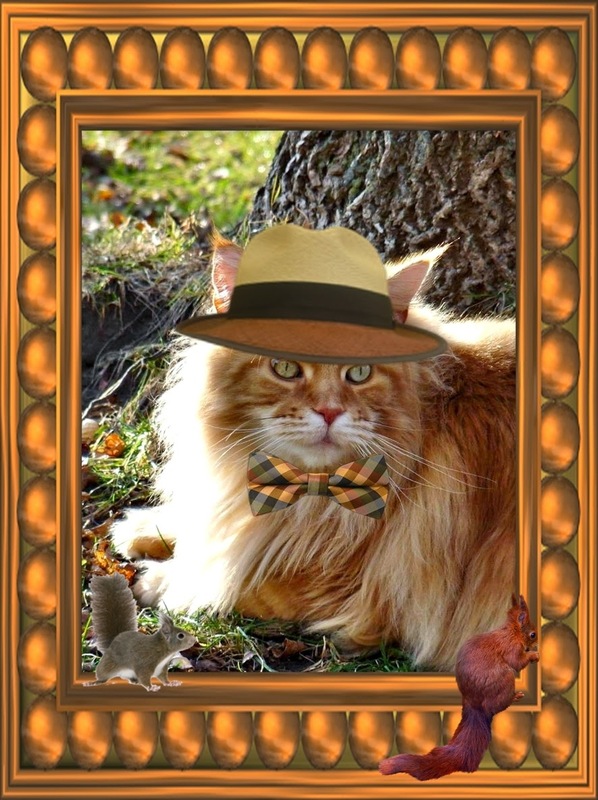 Dante is wearing an autumn-toned Panama hat, even though we live much north of Panama. 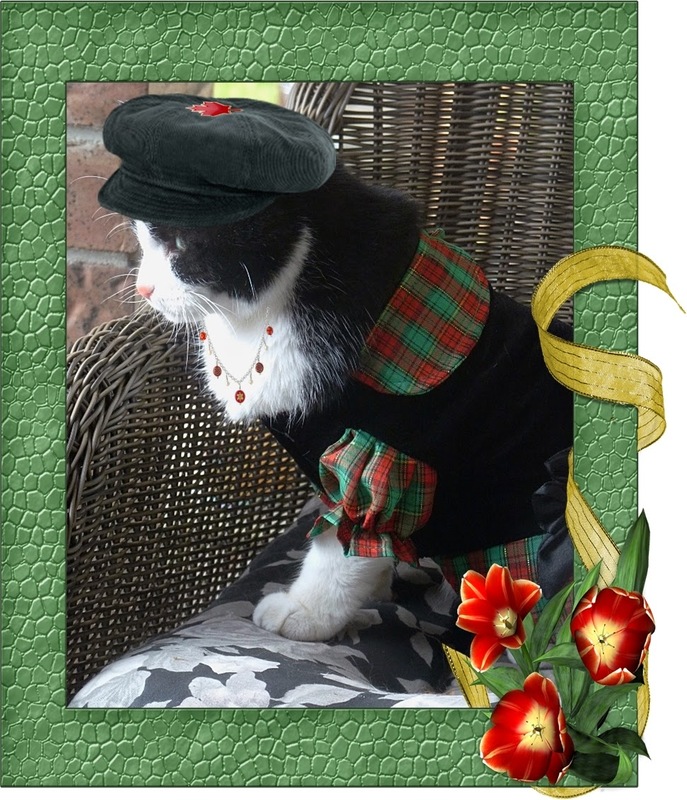 He thinks the colours go well with his fur coat, as does the bowtie that he's chosen to pair it with. He almost blends into the background in this outfit. Even the squirrels don't seem to notice him as they go about their business! 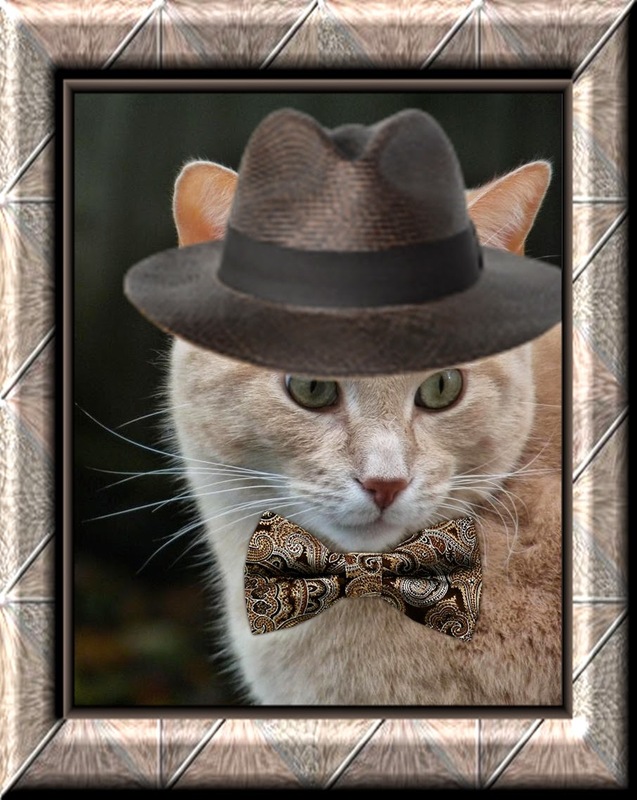 Dylan's a real sophisticat in his dark brown Panama hat and brown paisley bowtie. He looks ready for a night on the town (or even out of town, for that matter). If he wants to go for dinner with his fiance, Halle, he'll have to travel all the way to Louisiana. At least it's easier to sleep in First Class these days! Domino has urned her place by planting herself in one. 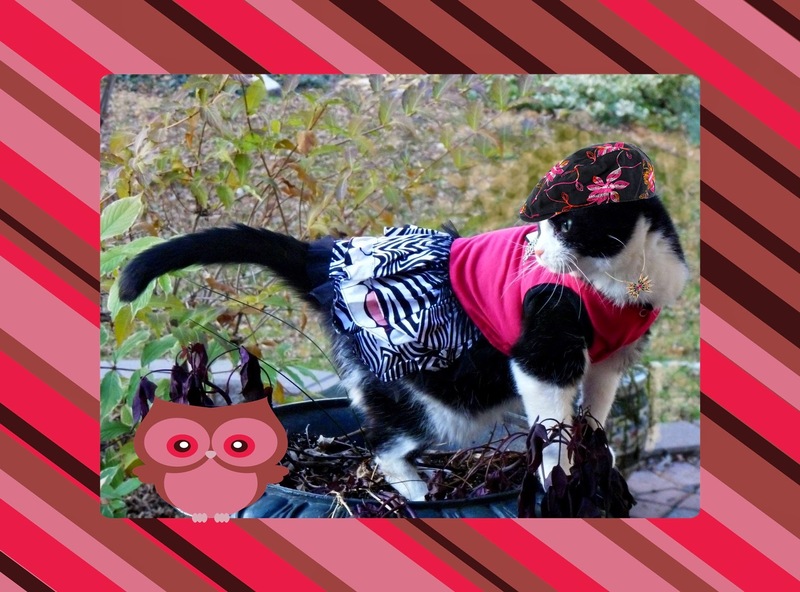 She is doing a reprise of the black velvet flatcap with pink floral embroidery, mostly because it goes with her fashion-forward frock. After all when it comes to fashion, she really gives a hoot (as does her friend, the owl)! She doesn't mind bringing up the tail-end of the purrade, because she knows they always save the best for last. 3-D CATS: WE HAVE SNOW! WORDLESS WEDNESDAY WITH DYLAN: ME AND MY SHADOW! DOMINO IS REDDY FOR ANYTHING!